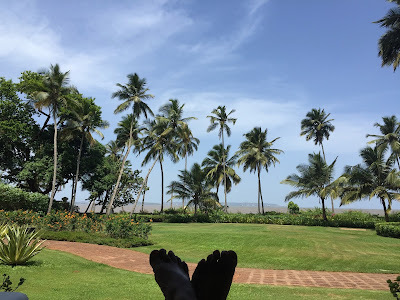 Until now, I have always chosen to fly to Goa rather than take the road, with the aim to squeeze in as much time within Goa as opposed to spending some on travel. 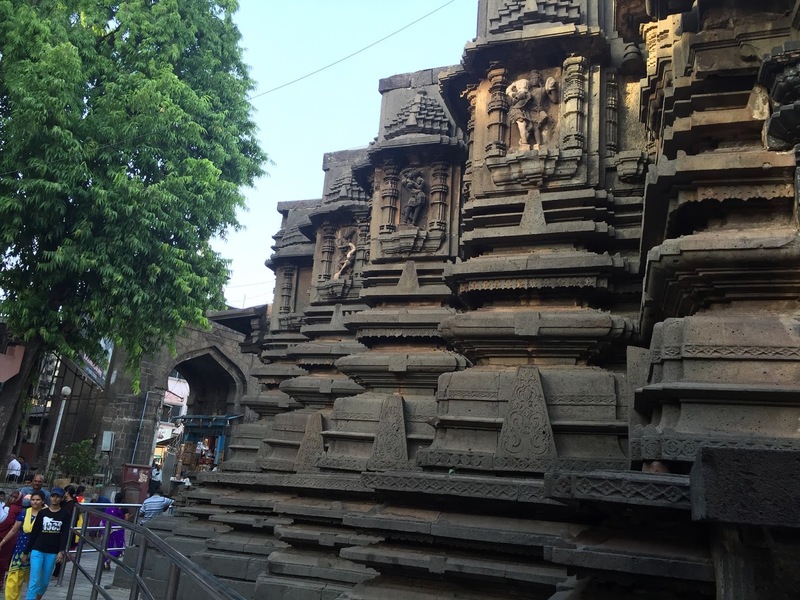 This time we decided to do drive down and even take a break at Kolhapur. While this meant investing two days of our vacation time to the travel itself, the journey was worth the effort and time. We started on a bright sunny morning from Pune and in an hour had crossed the city limits as we sped down the Pune-Bangalore highway towards Satara and Kolhapur. It was amazing to see how fast Pune had grown in the last decade. Areas that were just rocky hillocks were covered with a maze of apartment complexes and shops. The highway was well-maintained and it was an easy drive to Kolhapur. We had decided to stay the night here at Hotel Pearl. Pearl brought back memories of hotels I stayed in during the 80s and early 90s. The staff was friendly and helpful. The restaurant on-premise served very good 'Indian-style' tea with some snacks and we were quickly refreshed. We decided to take an auto rickshaw to the famous Mahalakshmi temple. I was fascinated by the temple. Built by the Chalukyas in the 7th century the temple still looks amazing. The dark stone pillars and the inner structure of the temple have weathered these long years so very well. Kolhapur reminded me of Pune like it was in the last 90s - less crowded and with little traffic. That night we decided to gorge on Kolhapur-style mutton. What better place to do that than Dehati? 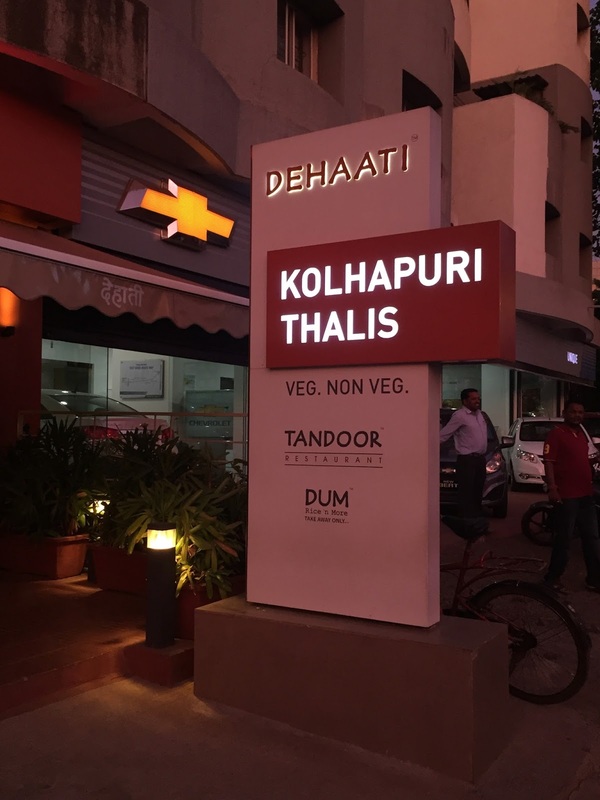 Dehati is a relatively new restaurant with a more upscale ambiance than the previous go-to places for Kolhapur mutton thalis. While they price their thali higher than others, they provide a better quality experience too. We gorged on the fiery but delicious mutton dishes with the freshly made bakhri breads. I was so full by the time we left, I could barely walk back to our hotel. We got up early the next day and were on our way to Goa even before the sun had risen. The front-office attendant and guards were very helpful and insisted on cleaning our car before we drove on. 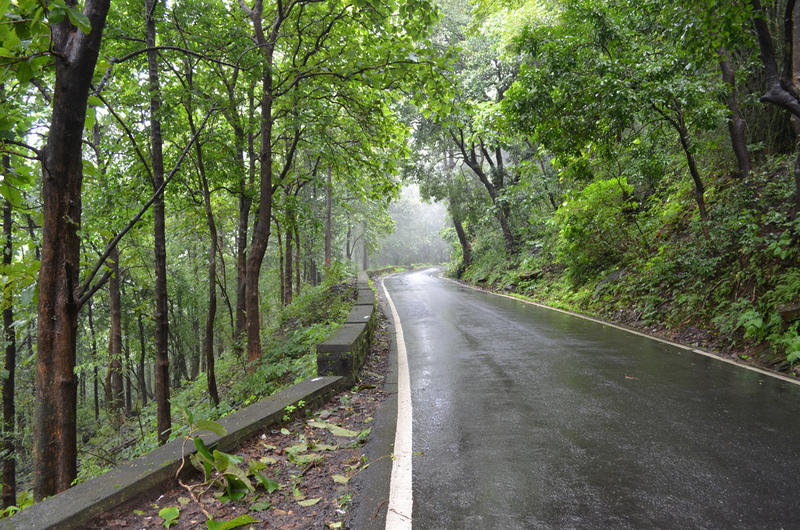 Soon, we had to turn off the main highway and into the narrower road that would wind its way past Amboli ghat. While the road on this stretch is a little more tricky with unexpected and un-marked speed breakers, it also is the more picturesque. 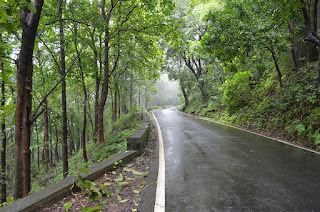 The remote villages, the winding road, and the cloud-kissed top of Amboli ghat is sure to excite the most jaded road warrior - especially so if you are here during the rains when everything around is verdant and green with little streams and waterfalls all around. We stopped on the top, eating freshly made Maggi, pakoras and tea as we watched the sun thin out the mist over the surrounding hills. Finally, we were back winding down the slopes on our final stretch. The vegetation began to change, the backwaters and coconut palms got more dense and then we were in Goa. Vacations are best when you do them slow! Taking the time to stay at Kolhapur, let us enjoy the entire time of the road so much more.